And this is exactly what I need for my holidays even though you’ll get to see it on the day I come back. WHAT IS USED? I did Ruffian naills with essie’s sunday funday from this year’s summer collection, accentuated with more essie nail polishes: pink metallic (jamaica me crazy), acid green (the more the merrier), glittery turquoise (naughty nautical) and a glittery blue from last year’s summer collection (bikini so teeny). I thought about first painting the accent colour and then the rest but decided against it and did it the other way round, using the french nails stickers again instead. Then I added some small dots for the fun (my dotting tool is a normal pencil by the way). HOW DOES IT FEEL? Summery. But I think I like French Nails or Half Moons better than Ruffian Nails. This was why I added some differently colored dots to give it a bit more of a fun character. They lasted four days of heavy use e.g. swimming in the pool and in the sea 1-2 times a day, playing in the sand, climbing rocks and so on. Maybe I try another ruffian colour combination in autumn. I saw nice combinations of matte black and gold or something with a dark red… And this makes me long just a little be for autumn. Isn’t that weird? 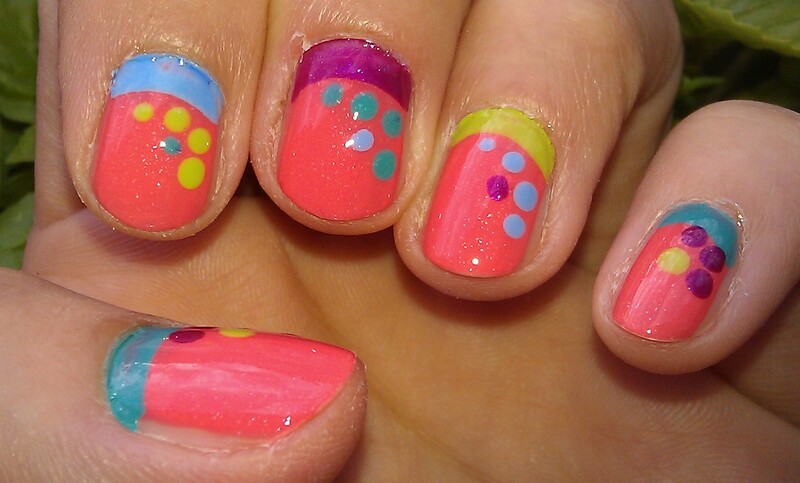 Check out my other nail arts for the 31 Days Nail Challenge too. This entry was posted in Nail Art and tagged 31 day nail challenge, bikini so teeny, Dotted Mani, essie, jamaica me crazy, Nailpolish, naughty nautical, Ruffian Nails, sunday funday, the more the merrier by kathatravelling. Bookmark the permalink.